Ensure comfort, convenience, and productivity on the job site with modified shipping containers. Inherently durable and mobile, repurposed shipping containers stand up to the harsh environments found at industrial job sites. 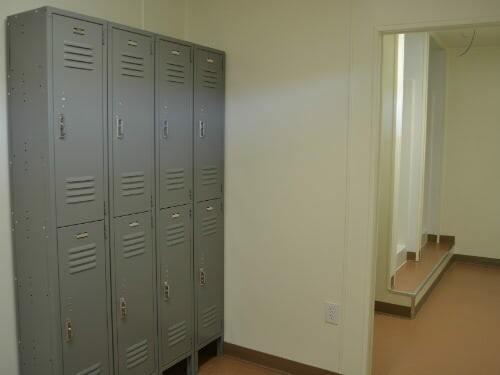 Falcon Structures’ modular locker room and restroom buildings arrive fitted with climate control equipment, turnkey plumbing, and easy-to-clean interiors. Security and privacy features further enhance employee comfort, morale, and productivity. Portability enables you to relocate shipping container buildings right on the job site. 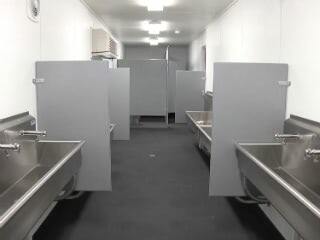 Need ADA compliance for a public restroom building? We can make it happen. Employees who work at remote job sites - in extreme weather, or with hazardous materials - need a comfortable space to take a break, shower, and change clothes. Falcon’s climate-controlled modular locker room buildings check all of the boxes and more. An industry leader in offshore oil construction and mining asked Falcon to design a climate controlled, mobile restroom for its field employees. The easy-to-clean, comfortable, shipping container solution improved efficiencies and raised employee morale on the job site.